By Grace Ann Terhune of the Southern Beauty Shop Mystery series as dictated to Joanna Campbell Slan (who likes to think of herself as an author, bless her heart). Oh, and the next book in that series will be Wave Good-Bye by "Lila Dare." Release will be April, 2013. "Well, that tears it," said my best friend Vonda in a husky voice. "Just when you think that people couldn't possibly stoop any lower, they do." I paused while eating the wonderful chicken piccata that her husband makes for the guests at Magnolia House, the bed and breakfast they own. Vonda pushed her plate aside and dabbed her eyes. She'd left the table just long enough to tell her son and his friends not to bounce a tennis ball against the garage, and now this. I waited. She pouted and sipped her wine. I gave in, as I usually do. When you've been friends for decades, you know what's expected of you. She was waiting for me to prod her gently, so I did. "Um, what's up?" "My Baby Jesus is gone." "Someone took him right out of that creche scene we put up on the lawn. Didn't you notice? You musta walked right past it." "Jesus isn't supposed to make an appearance for another week," I said. "I know because I still have shopping to do. So, yes, I saw the empty manger, and no, I didn't think twice about it. Why on earth did you put him out there early?" Her lower lip wobbled. "Because I like seeing him there. Reminds me of the reason for the season, and now he-he-he's gone!" After finishing my food, I left her sniffling. I was walking home when my cell phone rang. I recognized the number of John Dillon, a Georgia Bureau of Investigation officer. He and I met because trouble seems to follow me around. I told John all about the theft. "Is there anything you can do? I know you have bigger fish to fry, but she's pretty upset." "You're suggesting I do an Amber Alert?" asked John with a bit of amusement in his tone. "Or considering who's missing, an irridescent gold alert? I'm not trying to be dismissive. The best way to get Jesus back in that manger is to let folks know he's missing in action. At the risk of sounding sacreligious, she should handle it as though he were a lost dog. Put up posters. Someone's bound to have seen the culprit." Doing a neat U-turn, I headed back to Magnolia House. Once I got there, I told Vonda about John's suggestion. "Beats doing nothing," I said. So we spent twenty minutes on the Internet looking for photos of a Jesus that matched Vonda's recollection of her Savior. When we found one that she considered passable, we printed up fifty flyers in full color. Armed with thumbtacks and half the stack, I started home again. This time I tacked "Have You Seen Jesus?" posters to every telephone pole along my way. The next day, our local paper, the St. Elizabeth Bugle, ran a headline, "Is Jesus Really Missing?" Some stupid reporter interviewed several local ministers and turned Vonda's errant creche scene figure into a theological debate. I shook my head. John called and chuckled, "You did a great job of getting the word out." "Have a little faith, Grace Ann." "I have lots of faith," I said. "But if YOU have bigger fish to fry, don't you think God does, too?" John's laugh was soft. "His eye is on the sparrow." I hadn't hung up five minutes when Vonda rang. "He's BACK!" "Baby Jesus. Showed up this morning on my doorstep with a note." I shook my head and marveled. "Come on. Don't leave me in suspense. Read it to me!" Vonda cleared her throat. "To Whom It May Concern: My sister drove down from Boston with her Newfoundland, Mandy. Somehow Mandy slipped her leash. We guess the stress of the long car ride had made her nervous, because she ran off. After hunting all over for her, we went back to my house and hoped she'd find her way home. About midnight there was a scratching on the door. Mandy stood there with your Baby Jesus in her mouth, hanging from his swaddling clothes. We cleaned all the slobber off. Sorry!" Vonda and I had a good laugh. When we settled down, I said, "I think you should call the Bugle, Von. 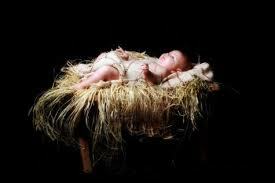 Let them know that even when he seems to have forsaken us, Baby Jesus will find his way back into our hearts." You could win a copy of Wave Good-Bye, Book #4 in the Southern Beauty Shop Mystery Series, when it's released in March, by commenting on this short story! Come back tomorrow to see if you've won. Remember--Cozies are easy to mail and media rate postage costs about $2.50. What a deal! Lol, this was a very sweet but fun story. If that is an example of your writing, I will for sure add your books to my wishlist. How very delightful! This story made my heart glow with happiness! Thanks for posting for us! A fun story and one of those which enbodies the Christmas Spirit. Just goes to show if you let enough people know, the lost becomes found. Cute story befitting the season. A great way to start the day. The story was perfect for the Holiday Season. Thank you! Loved the story. Happy Holidays. Wow, what an amazing story on so many levels. I loved it. If you like this, you'd probably like my other work, including the Kiki Lowenstein Mystery Series and my new series featuring Jane Eyre as an amateur detective. That series starts with "Death of a Schoolgirl." What an great story to read to start my day! Love it. Thank you and Merry Christmas! Very cute but heartfelt story... Love it Joanna. Love this story. My Mom leaves a little plastic Nativity scene on her book shelf all year round and for the last 17 years all of the grandkids have played with Baby Jesus when they visit Granny. I don't ever remember any of them questioning why he was there in the summer and not just at Chritmas and he has done just about everything that little kids do with dolls or action figures! What a lovely, sweet story. I can hardly wait to get to know these characters better when Wave Good-Bye is released. You have already given us Kiki and friends to know and love as well as let us get to know Jane Eyre even better. I am excited now to add Grace Ann and Vonda! Keep up the great work. Great story. I love your Kiki series. I also look forward to the continuation of the Lila Dare series. It must be an interesting challenge to take over a series someone else started. LLk 10, yes, it was a challenge, but I enjoyed every minute of it. Writing The Jane Eyre Chronicles was/is harder because of the research and the archaic voice, but Grace Ann is a lot of fun, and I "get" her. Great story. Reminds me of something I saw recently with a puppy sleeping in a church yard manger scene with the baby Jesus. A stray in the manger... I have all the Lila Dare Southern Beauty Shop mysteries. Love them. And I've had "Wave Good-Bye"
in my wishlist ever since I saw it was coming out. Jesus always comes back to those with an open heart. Loved this story! Thanks for putting the focus back on the true meaning of Christmas! Can't wait to read more in this series. Loved the story. I enjoy both Joanna's and Lila's books. Cute story and a fun, unexpected ending. Can't get too much Jesus. Great blog. Enjoyed your story. I love the story, and Mandy sounds like my kind of dog. That was a cute story. Earlier this year I bought Dye Job, the third in the series. I have cats and one of them, Fluffy, likes to drool. He gets happy when he gets attention and then he drools. Loved the story. I'm glad they cleaned the slobber off. thank you for this sweet short story!!!!! This is one of my favorite cozy series! I can't wait for the new release!! An entertaining and fun story. Thanks for posting. This was just wonderful thank you. Loved the story. Looking forward to the upcoming releases in all three of your series. Keep up the great storylines. Happy holidays! I love this series and look forward to reading the new installment. Thanks for the Christmas story! What a cute story--dog slobber and all. I'd love to win any book that Joanna Campbell Slan has writter. Using a random number generator, I drew Elaine Ellen as my winner. If you liked my story, I humbly suggest that you join my mailing list on my website www.JoannaSlan.com and share this short, short story with a friend! This book sounds really good. Haven't read any by Joanna Campbell Slan, but I'm going to sure check them out. Thanks, Melina. I hope you will give my work a chance!